When you use the RenderTransformOrigin property of an element to specify the point of origin for all render transforms, you typically express X and Y as normalized coordinates. X and Y both range from 0.0 to 1.0 as the position moves from one side of the element to the other. You can also specify X and Y values that are less than 0.0 or greater than 1.0, indicating a point that is outside the element’s boundaries. (Possibly quite distant from the element). 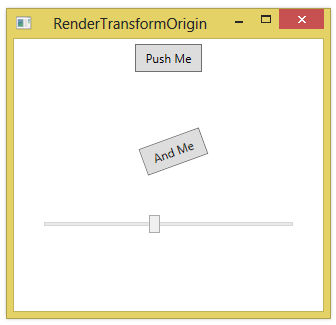 In the example below, the origin for a rotation transform is set to be off to the right of a Button. 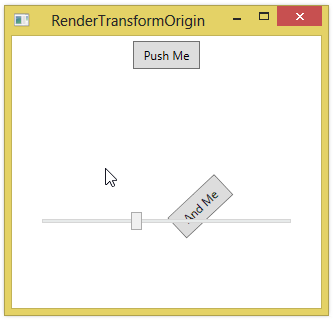 The Slider allows you to try out different rotation angles at runtime. <Button Content="And Me" HorizontalAlignment="Center" Padding="10,5" Margin="5"